This title was first published in 2001. 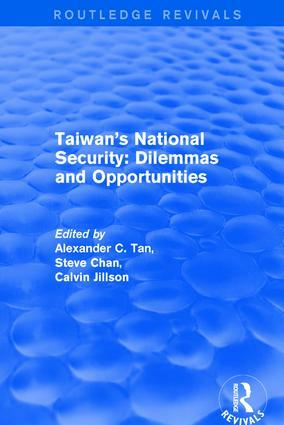 Clearly structured and very accessible, this book rigorously examines the key issues affecting Taiwan’s increasingly precarious position as an independent nation. An impressive supplementary resource text for Asian politics and international relations courses. Contents: Taiwan - opportunities and challenges, Robert A. Scalapino; Successful democratization in the ROC: creating a security challenge, Cal Clark; National identity and Taiwan security, Chia-lung Lin; The republic of China on Taiwan’s pragmatic diplomacy, Bruce J. Dickson; Taiwan in APEC’s trade structure: Deutch and Hirshman revisited, Steve Chan; Risk diversification: ensuring Taiwan’s security, Alexander C. Tan with Scott Walker and Tsung-Chi Yu; Index.